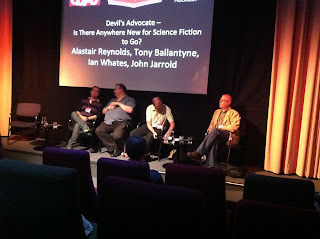 Floor to Ceiling Books: AltFiction Panel: Is There Anywhere New For Science Fiction To Go? AltFiction Panel: Is There Anywhere New For Science Fiction To Go? This panel aimed to discuss whether there is anywhere new for science fiction to go. First of all, the panel discussed some generalities. I think a small problem is that the bulk of the panel was formed of authors who write science fiction, so of course they were going to say that there are still places for science fiction to go! They commented on such beliefs as: science fiction is the literature of possibilities, so, until we know everything there is to know, there will always be more to say. I think this was a very fair point – it wasn’t *that* long ago that gravity was discovered and the world was deemed to be round rather than flat! We’ve moved on so far, so swiftly that progress even further is inevitable and will lead to more literature of possibility. Alastair indicated that science fiction writing is almost a defence mechanism to the science emerging now – it is a way to comment on how we will deal with the new technologies. I was interested in the discussion about “spaceship” science fiction. Although the panel concurred that there was still a place for epic space opera (a relief, no doubt, to Alastair Reynolds, Peter F Hamilton and Iain M Banks! ), they also agreed that retro should be avoided. This was linked to the discussion they had about whether science fiction holds itself too fondly and looks backwards to a “golden age” too much. It’s funny to me, because within the fantasy genre, there is a definite harkening back to writers such as Tolkien and a desire to emulate, whereas science fiction always wants to push on and try not to look back. I was dismayed by the panellists’ general reaction to YA, when it was suggested that one of the futures for science fiction was to introduce more YA fiction. There was a statement that, in fact, some authors have done everything possible to avoid being “lumped into” YA! I’m surprised at this slightly sneering attitude to an area that is exploding with possibilities and ideas, especially given the success and ability of such authors as Patrick Ness. For me, there is a real opportunity to start drawing in readers from a YA level into the genre of science fiction – young readers who might then progress to the aforementioned space opera kings. Certainly fantasy has been enjoying the crossover appeal of YA, with some fantasy authors such as Stephen Deas and Chris Wooding openly embracing the inherent appeal of YA. I think that these authors are ahead of the game, frankly, since YA readers will recognise their names when browsing the adult fantasy shelves and hence be more likely to pick up their novels. I also don’t like the sneering tone that was applied to YA. Why do we always end up looking down on some form of fiction? We get so annoyed when people do it to science fiction and fantasy – why would we then do the same to other areas of fiction, especially one that is, frankly, enormously lucrative and progressive? Inevitably, the question of women in science fiction came up in this panel. It was commented on that the panel was formed of four middle-aged white men, and that was felt to be derivative of what science fiction was offering right now. The problem is that none of the panellists could give a good reason for why there are not more women represented, except that John Jarrold did offer the fact that less women submit science fiction. Having been slush reading for Angry Robot and focusing particularly on the science fiction submissions, I would concur. I would like to support the women by suggesting their manuscripts but when they aren’t even submitting, that becomes an issue. It was said that there are currently only six women in contract to write science fiction as well – I can think of Trish Sullivan, Jaine Fenn, Gwyneth Jones, Elizabeth Moon, (tentatively) Lauren Beukes (depending on whether you feel she writes science fiction or urban fantasy *grin*), Lois McMaster Bujold.... Anymore? I was amused at how fervently Alastair Reynolds talked against mash-ups within science fiction. He likes his sci fi as pure as possible, from the sounds of it. I did accept his point, though, that since science fiction is the genre of possibilities, as soon as you add impossibilities (like vampires or zombies) it dilutes the profound effect that science fiction can have. Military science fiction was also touched upon. I asked whether this would always be a future of science fiction, since we are constantly dealing with the realities of war in real life. The panel said this is how it “should” be, but wasn’t since a lot of military science fiction is actually Napoleonics in space *giggles* It was considered that a potential future to science fiction might arise when those who have been involved with Iraq and Afghanistan turn their hands to writing fiction, and imbue their writing with a flavour of modern warfare. Finally, the different cultures that can be brought to science fiction was addressed. Obviously Lauren is writing with a strong African flavour, and Al Reynolds forthcoming novel is going to involve Africa as well. India has been used by Ian McDonald. Lavie Tidhar is aiming to produce anthologies featuring writers from different cultures, starting with Chinese. Now that we are a far more international community, it seems fitting that our science fiction reflects this fact. Finally, I leave you with the thought that Tony Ballantyne put across: when they were looking for the next Elvis, they found the Beatles. When they were looking for the next Beatles, they found Led Zeppelin. These were organic discoveries and demonstrated that looking for something similar can open your eyes to something new. Do you have any thoughts on the points made in this panel? Were you listening in at AltFiction as well – did I miss anything crucial? As far as I know, there are only two women sf writers in the UK in contract - Trisha Sullivan and Jaine Fenn. Gwyneth Jones is out of contract, as is Justina Robson. Moon and Bujold are surely reprints from the US. Also out of contract, I believe. Fascinating post! Interesting points. I would like to read more sci-fi by women - perhaps they are put off for some reason? Though many women write fantasy. I agree with AR about mash-ups. I'm not that interested in zombies, vampires, werewolves etc in fiction, especially science fiction. I like my sci-fi to be about tech, gadgets, space, future - but importantly - people's reactions/interactions with these things. I like Tony's comment - they'll always be something else to come along. I err on the side of positive. Sean, if you want to read more sf by women, check out the reviews on SF Mistressworks. Tricia Sullivan is also out of contract. So it is just Jaine Fenn. I'm not sure how we presented as a panel on the subject of YA SF but I'm completely open minded about it myself; I've even talked to my agent and editor about the possibility of doing some at novel length. I've also contributed two stories of Jonathan Strahan's YA anthologies. So there was certainly no intended sneer from my side. At best I'd call it benign skepticism - there was little or no YA SF when I was growing up - so I'm not wholeheartedly convinced that there's a need for it, not when so much SF is basically YA in content anyway. Thanks for the comment on YA, Al - I admit that maybe I did bring my own prejudices and grump to the section on YA. I love it myself, and was perhaps hard on you four! To the rest of the commentators, I just want to highlight the fact that Sarah Cawkwell (@pyroriffic on Twitter) is in contract for writing military science fiction. I just wonder whether the fact that she is in contract with Black Library and writes tie-in fiction makes a difference to you? It sure doesn't to me! Especially when there are sonic superweapons! Is Connie Willis considered SF? What about Elizabeth Bear? I am still working through reading/listening to some of the classic SF writers but I have been reading a few science fiction romance novels recently and those are all written by women. I think women tend to not write military and space battle SF so men clearly would not see that they are out there and writing. Liz Williams is still writing (she is working on a unique urban fantasy series) but from what I've read there is nothing in the works that is SF. When I did research for my site's Literature Unis (no, I'm not spamming), I found not only a large number of women sci-fi writers, but also a serious diversity in the branches of science fiction itself, one that testifies of sci-fi's ability to adapt to new situations, both general and personal. Take Mark Van Name's "Children No More". It's military sci-fi, but has nothing to do with outer space. Instead, it closely examines the horrific realities of child soldiers in our own world with a sci-fi veneer. Also, as was mentioned above, alternate history is an expanding branch of sci-fi, as is Steampunk. Vampires and zombies may be more fantastical than some sci-fi authors may be comfortable employing, but they certainly have a place in the genre, as Mira Grant's "Feed" proved. That bring's me to women authors of science fiction. In addition to Grant, there's Karen Miller, Karen Traviss, Christie Golden, N.K. Jemisin, and, if you count the near-future mystery In Death series, even J.D. Robb. And that's just a handful of the women who were nominated, which itself is only a small representation of the larger field of female sci-fi authors. Perhaps they're more famous for writing urban fantasy or paranormal romance, but women definitely make up a large portion of sci-fi writers. As for YA fiction, I believe you said all that needs to be said. We had four separate categories of YA fiction this year, with such "adult" authors as Terry Pratchett, Sherrilyn Kenyon, and James Patterson somehow finding their names on the nominee lists. I don't think it's been a stigma that's kept more authors from joining the ranks of YA writers as it has been marketing. When I was younger, I wrote to Piers Anthony and asked why his Xanth series (at the time) was not marketed more towards younger readers like myself. He wrote back and basically said that a younger reader is more likely to pick up an adult book than an adult is to pick up a child's book. However, with the recent advent of Harry Potter and Twilight, YA is increasingly viewed as a field of literature that adults can enjoy as well. And, as you said and as the authors I mentioned clearly recognize, it can be a bridge that younger readers can cross into more adult sections of the bookstore. There seems to be some confusion here: the discussion was regarding women sf writers in contract in the UK. There are many writing sf - eg, Gwyneth Jones, Justina Robson, Liz Williams - but they are currently out of contract. Karen Traviss's books are only published in the US. Connie Willis's books are reprints of US editions. Elizabeth Bear's books do not have UK editions.